It's more like a shooter than Rocket League. 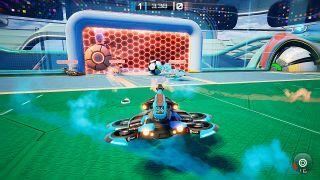 Competitive vehicle sports game Axiom Soccer is out today on Steam Early Access, and it's free to download and play. While superficially it looks a lot like Rocket League, it's more an effort to turn futuristic sports into its own sub-genre—instead of bouncing around the arena and pulling off impossible stunts to bamboozle useless players like myself, it's more about guiding a drone and shooting the ball with a variety of projectiles to poke it into the other player's net. I spoke to the creators at Earthbound Games back in December, when we sent members of the PC Gamer Club a key for the game. It felt a little too pared down then, but apparently it made a good impression at the Rezzed event in London last week, so I'm curious to see how it's developed since then. Axiom Soccer supports up to four players locally, then up to six players online. It's got customisable vehicle components, which is presumably how the game will eventually be monetised—the developers cite Apex Legends and Fortnite as making a case for why free-to-play was the right route.